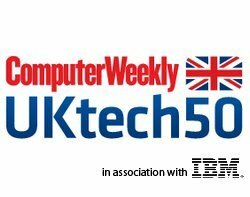 Computer Weekly has announced the final listing for the second annual UKtech50, the definitive list of the real movers and shakers in UK IT. Computer Weekly has announced the final listing for the second annual UKtech50, the definitive list of the real movers and shakers in UK IT - the CIOs, industry executives, public servants and business leaders driving the creation of a high-tech economy. Our aim was to identify the 50 most influential leaders in UK IT – the people who will be central to developing the role of technology in improving the UK economy. A panel of expert judges and an online reader vote were used to compile the names and their position on the UKtech50. Here we present the list in full – the 50 most influential people in UK IT this year. Mike Lynch, voted this week as the most influential person in UK IT, doesn’t like to think about challenges, but about opportunities. If there is someone in UK IT who knows about opportunities, that person is certainly Lynch, who co-founded Autonomy in 1996 and grew it to become a multinational business that he sold to HP for £7bn. Lynch was announced as the winner of the UKtech50 2011 this week – Computer Weekly’s search for the most influential individuals in UK IT. The Autonomy CEO – who now also has the rather more cumbersome title of executive vice-president, information management at HP, is a true believer that the UK IT industry is in the verge of something special, with change in delivery models, the cloud becoming more important and unstructured information – his bread and butter – moving further into the realms of video, audio and social, away from the traditional database model. Click here to read our full interview with Mike Lynch on winning the UKtech50. ARM is at the heart of the digital revolution, and as CEO, Warren East is in a powerful position. ARM a UK technology companies leading its field globally, with its chip designs used in many Apple products and most mobile phones. He is a role model for UK technology firms and budding entrepreneurs, and one of the major global representatives for the UK IT industry. According to ARM, its chips power around 95% of the world’s smartphones, with over 10 billion products shipped with ARM chips. Microsoft is launching its first version of Windows for ARM processors next year, and graphics processor firm Nvidia has signed a licensing deal to use ARM chips as well. After more than seven years as CIO at the Department for Work and Pensions and a year as government CIO, Joe Harley is retiring in 2012, leaving a gap to be filled as well as huge challenges. Harley played an important role in the delivery of a new IT strategy and strategic implementation plan. The successor will not have a dual role like Harley. But the government CIO role alone is a big job on its own - arguably, one of the biggest in all of Whitehall. Who else will have the opportunity to fundamentally reform a key part of the Civil Service, and potentially save billions of pounds a year for the Exchequer? Phil Smith goes into 2012 as the new chairman of the Technology Strategy Board, the government-backed innovation agency charged with dispersing millions of pounds of public sector funds to boost science and technology. As Cisco’s UK chief, he also has a big role to play in 2012, with the networking firm’s $500m investment supporting London’s Tech City and other tech start-ups. Cisco is also a key London 2012 supplier, and as part of its contribution to the Olympics legacy the firm is setting up 30 Cisco Network Academies in East London schools. He sits on the board of the Thames Valley Economic Partnership, holds a board seat at the Young Enterprise and also a board member on the IT & Telecoms Industry Board of e-Skills UK and the Employers Forum for Disability. As minister for the Cabinet Office, Maude has significant influence over the direction of the central government IT juggernaut. When cuts are announced, they are announced through him, with departmental CIOs watching to see where his gaze will fall next. He has already delivered billions of pounds worth of cuts in government IT, and more are expected. He has focused on cutting consultancy fees, renegotiating contracts with big IT suppliers and reviewing hundreds of IT projects to see if they are worthy of continued funding. More recently, the IT strategy announced by the Cabinet Office in March highlighted open source as a key part of the government’s plans and a purchasing priority. For a few weeks in 2012, Gerry Pennell will arguably be the most important IT executive in the UK. Imagine what would happen if, at the moment Sir Chris Hoy crosses the finish line in his Olympic cycling final next year, the IT systems had a glitch and the result wasn’t broadcast as millions of spectators follow the competition worldwide through TV, web and mobile phones. How’s that for pressure on the IT department? For the technology supporting the most watched sporting event in the world, failure of any kind is not an option. Building, integrating and managing the technology supporting the London Olympic Games is one of the most complex and high-profile assignments in IT, and London 2012 CIO Gerry Pennell is the man responsible for its delivery. With one billion computer transactions processed per year touching virtually every person in the UK in one of the biggest technology operations in Europe, Phil Pavitt, CIO at HM Revenue & Customs, has one of the most challenging tasks in public sector IT. When he took the role at HMRC, Pavitt joined an organisation with a poor reputation for IT - caused by failures such as tax credits, a controversial deal with EDS, and the scandal caused by the loss of CDs containing the child benefit records and other personal data of 25 million people. Pavitt went on to deliver a programme of considerable IT change across HMRC, aiming to cut spending by more than £160m per year. In 2006, Darrell Stein became CIO at Marks & Spencer. The appointment was a homecoming of sorts for Stein, who started his career at M&S as an IT graduate in the early 1990s and rejoined the company motivated by the challenge of introducing change. Experience acquired in various IT management and consultancy roles enabled him to take on the challenge of completely restructuring the retailer’s IT group. By the second year of his tenure, Stein had already reduced incremental IT spend by 60%, with the overall cost of technology remaining flat, the result of a “spend and save” approach introduced after the creation of the IT strategy. At M&S he also has a seat on the operating board and responsibility for logistics. Tom Steinberg is the man who has shown the public, private and voluntary sectors how powerful technology can be when used in a practical and efficient way to improve people's lives. He is the founder and director of not-for-profit organisation MySociety, which runs democracy websites in the UK, including Parliamentary transparency websites TheyWorkForYou and WriteToThem. With the government releasing more open data, and a Conservative leadership promoting the ideals of the Big Society, Steinberg will be the figurehead and role model for many such initiatives in 2012. Steinberg is also a member of the UK government’s Public Sector Transparency Board. As senior vice-president of design at Apple, Jonathan Ive is more responsible than most for the consumer technology revolution. Since introducing the iMac in 1998, Ive led a design team widely regarded as one of the best in the world to create ground-breaking Apple products including the iPod, iPhone and iPad. With over 300 design patents to his name, Ive was awarded a CBE in 2006. The products designed by Ive have prompted huge changes in corporate and consumer behaviour that are likely to be felt for years to come. One year ago, Ralph Rivera took over as the BBC director of digital media, originally overseeing the broadcaster’s computer, gaming and mobile products. He is responsible for delivery of all the BBC's digital media products on the web, mobile devices and internet-connected TV platforms. His remit also includes overseeing the development of the BBC's digital products – such as the iPlayer – and enabling ways in which these products can be experienced on desktops, mobiles, tablets and connected TVs. Rivera is also responsible for shaping and leading the BBC's R&D activities and ensuring that the broadcaster is up to speed with developments in technologies such as 3D and HD. Mike Bracken is responsible for improving the government’s digital delivery of public services in a major cross-government role that covers all of the government’s online presence. Bracken is leading on the work to transform public sector services to a "digital by default" model by building and championing a digital culture that puts the user first and delivers the best, low-cost public services possible. Engineer, computer scientist and academic Sir Tim-Berners Lee is a UK IT personality who needs little introduction. Rather than plunging into academic obscurity, the inventor of the World Wide Web remains active in the industry. Berners-Lee was recruited by then-prime minister Gordon Brown in 2009 to help make government data more accessible on the web and alongside Professor Nigel Shadbolt, he launched public data repository Data.gov.uk. The coalition government recently appointed Berners-Lee and Shadbolt as directors of the Open Data Institute which will innovate, exploit and research open data opportunities with business and academia. One of the best-known names in the UK IT leadership community, Paul Coby spent nearly a decade as CIO at British Airways (BA), before leaving the airline in January this year following the merger with Iberia. Soon after, he became IT director at department store chain John Lewis, tasked with improving the retailer’s customer shopping experience through a multichannel offering as well as modernising the IT that makes the business tick. Coby is also a member of sector skills council e-Skills UK and chairs the National IT Skills Academy. Matt Brittin leads an operation that is Google’s second largest after the US and the most advanced in terms of e-commerce and online advertising spend. Brittin has defined himself in interviews as “fiercely supportive of the UK media landscape” and has positioned Google as a key player in a new environment where traditional publishers are still working out how to survive in the digital age. Under Brittin’s watch, Google is also leading Getting British Business Online, an initiative focused on helping small businesses get online, as well as supporting the Tech City initiative in East London. Chris Chant's day job involves introducing cloud computing to Whitehall - a task he sees as being as much about cultural change as technological change. Chant has recently become one of the most vocal supporters of IT reform in Whitehall. He is the voice of discontent about the status quo - the sort of maverick role that Whitehall press officers would never have countenanced in the past. Chant has previously been CIO at the Department for the Environment, Food and Rural Affairs, and at the former Inland Revenue where he led delivery of the online tax self-assessment system. For the past couple of years, Martha Lane Fox has been leading a drive to reach the nine million people in Britain who have never used the internet, attempting to get them signed up and aware of the benefits that the web can bring. Lane Fox’s current title is Digital Champion, and her initiative is one of the few that has survived the coalition’s cull of technology-based projects. Last year, she submitted the "Directgov 2010 and Beyond" report with recommendations for the future of online public services, which resulted in actions including the creation of the director of digital role, for which Mike Bracken was appointed in July 2011. Ian Watmore has one of the most powerful positions in government IT, being one of the leading members of the panel that determines the fate of many IT projects. As COO of the Cabinet Office Efficiency and Reform Group, his job is to look for inefficiencies in central government in several areas, including IT. A former chief executive of the Football Association, Watmore returned to Whitehall this year having previously been the first ever government CIO. As well as looking for efficiencies in areas like IT, his job includes exploiting economies of scale and reducing duplication. As such, Watmore is someone for all wasteful public sector IT departments to beware. An award-winning technology entrepreneur, Kate Craig-Wood is co-founder and managing director of cloud company Memset. She is an advocate of green IT and cloud computing, chairs Intellect’s climate change group and was also a key player in the technical architecture of the Cabinet Office’s G-Cloud and App Store project. Craig-Wood is the youngest-ever main board member of Intellect, the UK’s high-tech trade association, and was recently selected to join a government mission to San Francisco to showcase the best of British cloud computing technology to Silicon Valley. She also won this year’s Social Media Champion accolade at Computer Weekly’s Social Media Awards. Willem Eelman became global CIO at consumer goods giant Unilever in April 2010, with an innovation development budget of some €300m. Mike McNamara this year faced the unenviable task of succeeding his new boss, Tesco CEO Philip Clarke, as the retail giant’s CIO. Clarke was last year’s winner of the UKtech50 poll. Katie Davis is responsible for resolving the mess left behind by the NHS National Programme for IT, and navigating the NHS information strategy through the complex politics of the wider NHS reorganisation. David Willetts is a key player in the government’s plans for improving science and technology education and boosting IT apprenticeships. As one of the leading council CIOs, Jos Creese is a major player in overhauling local government IT and the move towards shared services. As CEO of the UK’s biggest technology firm, Livingston oversees the telco’s £2.5bn investment in fibre-based superfast broadband roll-out – a key driver for the future of the UK economy. Ed Vaizey holds ministerial responsibility for broadband and Ofcom’s much-delayed auction of radio spectrum for future 4G mobile networks. A vocal supporter of open source, former local councillor Liam Maxwell has been brought into the Cabinet Office to help shake up the way Whitehall departments buy IT. With £650m to be spent on the UK’s new cyber security strategy, Neil Thompson holds a key position in plans to protect the UK’s national infrastructure from cyber attacks. Ailsa Beaton not only runs the IT for the UK’s biggest police force, but will also play a significant role establishing the new semi-private organisation that will run national police IT systems. Simon Moorhead is responsible for the critical analytical and payment systems that underpin the function of the Bank at the heart of the UK’s financial system. He is also leading IT integration with parts of the Financial Services Authority as the Bank takes on new responsibilities for regulation. He represents the UK on the European Central Bank’s IT committee. Paul Cheesborough is leading a move to cloud computing at one of the UK’s most influential media organisations, increasingly a technology role model for the wider media industry. The former BT chief scientist, JP Rangaswami is one of the UK’s best known technologists, an evangelist and innovator who was among the first to see the potential of social media in the enterprise. As the third Royal Mail CIO in less than 18 months, Doran inherits a controversial IT transformation programme, as well as the likelihood of splitting off the Post Office as part of the reorganisation of the UK postal service. As CEO of the Chartered Institute for IT, David Clarke represents the UK IT community to government and across the IT industry. Ken Olisa runs the boutique technology merchant bank Restoration Partners, and is a major player in the UK’s tech start-up and funding scene. An IT industry veteran, Jim Norton this year holds the post of BCS president. He sits on numerous influential IT committees and advises many organisation on IT policy. The Open University is leading a move to open education, and David Matthewman is a key figure in using the web and social media to provide lifelong learning materials to all. The founder of famed dot com firm First Tuesday, Julie Meyer has been one of the most influential people in the UK tech start-up and entrepreneurship scene for over 10 years. John Higgins has led the UK’s technology trade association, Intellect, for over 10 years, and in 2012 takes up a new role in European tech lobby group Digital Europe. TechHub is at the heart of the London Tech City movement to attract start-ups to East London and boost investment and innovation in UK IT, with Elizabeth Varley as its CEO. Glyn Evans has a key role in transforming IT at the UK’s biggest local authority, and this year also takes on the presidency of public sector IT user group Socitm. PICTFOR (formerly PITCOM) is the Parliamentary IT Committee that brings together IT industry representatives and parliamentarians to discuss IT policy. Chaired by Alun Michael. With the IT and computing education curriculum ready for a major overhaul, Michael Gove will be making decisions that affect a future generation of IT professionals. Simon Wardley is a regular conference speaker, and a thought leader advising companies on the intersection of IT strategy and new technologies. In addition to his CIO role, Andy Nelson is senior responsible owner for ICT capability and the G-Cloud as part of the government IT strategy – and a candidate for the vacant Whitehall CIO role. Following a reorganisation at Transport for London, Steve Townsend was promoted to CIO in July 2011. He looks after the technology that runs London’s Tube and bus systems. The Wellcome Trust is the second largest medical charity in the world after the Bill and Melinda Gates Foundation, making Mark Bramwell the leading CIO in the UK not-for-profit sector. Recently voted CIO of the Year at the UK IT Industry Awards, former Boots CIO Rob Fraser leads the technology function at one of the UK’s largest retail chains. As CIO of the UK's largest dedicated home delivery and collection service, delivering 200 million parcels a year, Greg Smith oversees the IT behind one of the country’s most complex distribution networks.